Our first excursion was to St. Peter’s Basilica. 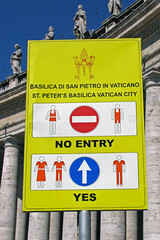 It was crowded inside today: many parts were cordoned off for the Papal Mass for Pentecost that will take place tomorrow. Seats are already set up, and grey velour curtains create the sense of a somewhat smaller space – and probably improve what one sees in the televised version. We went in three groups. 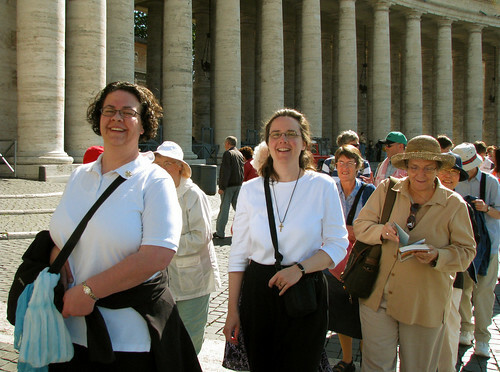 Sister Kym Harris of Australia (with hat, in beige) was the leader for our group. The photo here shows us waiting to go through security to enter St. Peter’s (yes, all our bags go through a screening device, and we walk through metal detectors). Saint Peter’s was designed with the two colonnades as a symbol of the Church’s embrace of all who want to enter, and that is the sense that one has walking into the plaza. Although security measures require lines to get in, and a particular flow of movement inside, nonetheless, the atmosphere of quiet is impressive. I spent some time in the Blessed Sacrament chapel – the only place reserved entirely for prayer. I learned later that this space had not been open to the public and, in fact, there had not been a place set aside only for prayer, until about 17 years ago. There is a story that was told by one of the ‘English Guides to St Peter’s’, of a unexpected visit to the basilica by John Paul II one morning. The attendants asked him why he was making the visit. John Paul supposedly said that St Peter’s was becoming more a museum than a church, and that there was no place reserved for prayer. The pope then celebrated mass in the Blessed Sacrament Chapel, and had it reserved thereafter as an exclusive place of prayer.